Rocky Mountain National Park takes on an entirely different character in winter, with snowcapped peaks, frozen lakes and waterfalls, wildlife such as deer, elk, moose, and coyote, and breathtaking views across a frozen landscape. 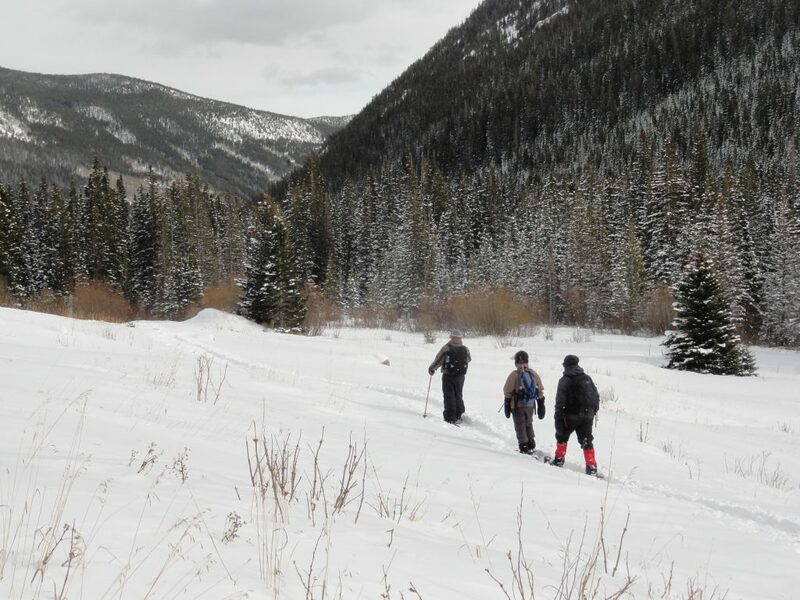 While Rocky Mountain National Park is a skier’s paradise, for those who love to take the easier road, snowshoeing through the park lets you see the best of the park on powdery trails. From Emerald Lake to the summit of Hallett Peak, Rocky Mountain National Park features a number of trails that cater to those who want a mellower trip through the lower basins, or top out on one of the park’s famed summits. Here are our favorite snowshoe trips of Rocky Mountain National Park. Travel to one of the most spectacular basins in Rocky Mountain National Park, where towering mountain walls soar above you. Emerald Lake, as it name implies, is one of the crown jewels of the park, with a shimmering icy layer, set in a magnificent alpine basin as Flattop Peak and Hallett Peak soar high above. From Bear Lake, the trail weaves through high viewpoints where we’ll have a vista overlooking Glacial Gorge and Longs Peak in the distance, while we hike past four lakes: Bear, Nymph, Dream and Emerald Lake. The trail climbs at a moderate grade and stays relatively flat, making this the perfect trail for families and beginner snowshoers. If there’s anything that Rocky Mountain National Park is known for it’s the spectacular alpine lakes. Bierstadt Lake sits on a high plateau just above the Mill Creek Basin. The lake can be reached via the Bear Lake Trailhead or the more direct Bierstadt Lake Trailhead. The trail weaves through dense forests; where there are opportunities to view deer and elk, frequent winter visitors to this area. Once at the lake, on a clear day, visitors are rewarded to an unforgettable view of the Continental Divide including Longs Peak, Hallett Peak, Flattop Mountain, and Tyndall Glacier. This is a great trail for hikers wanting a short trail to a secluded lake and a gorgeous view. By far one of the grandest views in Rocky Mountain National Park is Chasm Lake, which features a one of a kind panorama of the Longs Peak Massif including Longs Peak, Mt. Meeker, and Mt. Lady Washington. Starting from the Longs Peak Trailhead, the path leading to Chasm Lake steadily climbs through dense forest, passing by rushing streams and small waterfalls, as it makes it’s way up past the timberline and into an alpine meadow with views stretching far into the valley. Hikers then make their way onto a ridge where they get a full panorama of the North Face of Longs Peak including the famous Diamond Face, one of the most famous rock climbing routes in the world. Alongside Longs Peak, hikers also get to see nearby Mt. Meeker and Mt. Lady Washington, which make up this spectacular skyline of peaks. High above Emerald Lake, Flattop Mountain and Hallett Peak are two of the star summits of Rocky Mountain National Park, with their steep jagged lines, dagger-like points, and far reaching views over Wild Basin and Glacier Gorge. To stand on the summit of either of these two peaks, especially in winter, is to embark on one of the most classic hikes in Rocky Mountain National Park. Starting from the Bear Lake Trailhead, we’ll veer around the lake and then make our way up towards Flattop Mountain, on trails that gradually steepen as they climb through wintery forests, with a view that looks far down into the valley. We’ll then make our way onto rocky and snowy alpine meadows on Flattop Mountain. We’ll then reach a junction where the trail becomes moderately steeper and get a gorgeous view of Hallett Peak and Tyndall Glacier. We’ll then summit Hallett Peak where we’ll get views of Otis and Taylor Peak on one side, and Longs Peak and Mt. Meeker on the other side. This is one of the best summit views in the park. You won’t want to miss the opportunity to summit two of Rocky Mountain National Park’s best-known peaks in one day! Another classic park trail, Deer Mountain is a 6.2-mile strenuous trail that takes you up one of the smaller 10,000-foot peaks of the park, but gets you a splendid view of the Continental Divide. Climbing through switch backing trails, Deer Mountain ascends through dense woodland with occasional views overlooking the lower basins of the park. As we continue, we have a good chance of seeing deer and elk, and enjoy the solitude of the forest. The trail begins to moderately steepen, but just over three miles in, we’ll reach the summit where we’ll get a full view of the valley under us, and the Continental Divide stretching in the distance, which is especially beautiful when seen in the winter. This trail is popular but rarely explored in winter, with fun, powdery trails, and unforgettable views. 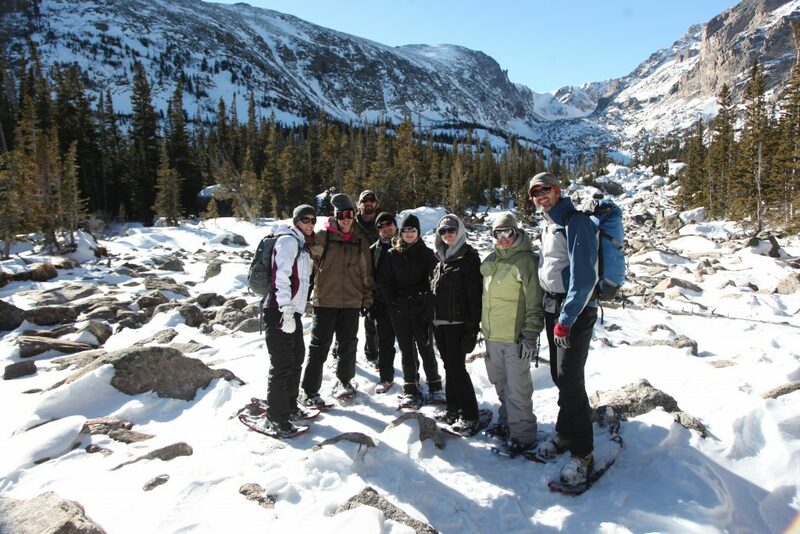 Snowshoeing is a great way to see the mellower trails of Rocky Mountain National Park and great when travelling with families and children. Our guides are experienced and enthusiastic about showing you our backyard. Call us at 720 242 9828 to book your trip today!